HDCD test pressings were circulated and have been widely bootlegged by fans without turntables and no other means of hearing the album. 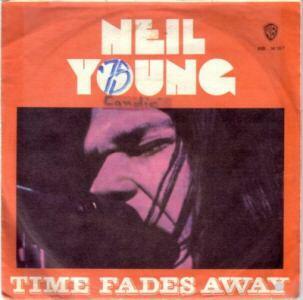 Searches on eBay regularly turnup worn out copies of Time Fades Away commanding top dollar in vinyl auctions. An autographed vinyl copy in excellent condition recently sold for $100.00. 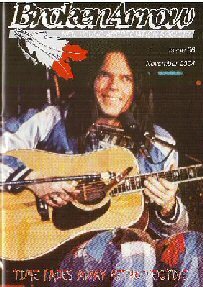 A recent issue of the Neil Young Appreciation Society's fanclub Broken Arrow Magazine (November 2004) featured extensive information by Pete Long on the Time Fades Away album and tour. While reading over the issue (edited by Scott "Surfer Joe" Sandie), Thrasher was inspired to do something about this long overdue omission from Neil's catalog. 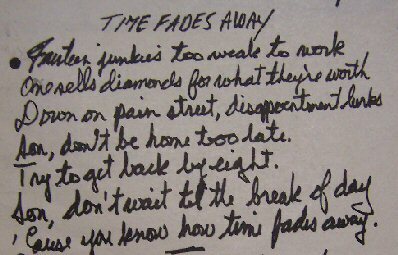 Time Fades Away is the first installment of the trio of albums known as the "Ditch Trilogy" along with his two other early 1970's materpieces Tonight's The Night and On The Beach. The edgy moody darkness of recording and brilliantly erratic song selection offer the portrait of the artist undergoing a deep catharsis and unraveling simultaneously. The tension is so palpable on the recordings that most listeners turned away -- or worse -- ignored completely. 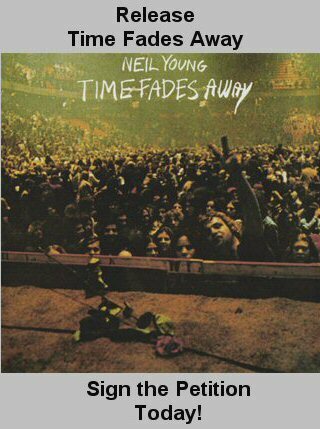 "There is a chapter in Neil Young's history that is often referred to as his Dark Period. A time when his personal life appeared to gradually disintegrate amidst a series of mishaps and misadventures while critical career decisions seemed irrational and ill thought-out. Yet, paradoxically it has become recognized as one of the most artistically productive and critically, if not commercially, acclaimed periods of his life. A period that spawned a trio of outstanding released albums and a legendary unreleased album." "This is no desperate throwaway or quickie live album. Loud and dense but never heavy, singing with riffs concocted from the simplest harmonic components, it's squarely country, yet it never hints at nouveau-rockabilly good times." 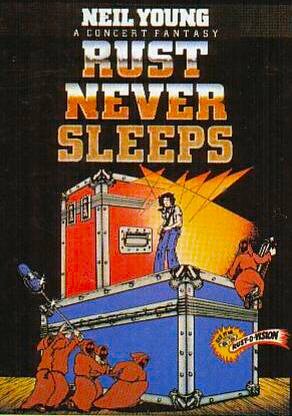 The Time Fades Away tour took place in the aftermath of Crazy Horse guitarist Danny Whitten's death. Whitten had been trying to kick a heroin habit and was fired by Young, who gave him an airline ticket home and fifty dollars. The next day Whitten was dead of an overdose and Young was devastated by the news. As the stress of the tour and grief over Whitten's death sank in, Young's concerts became more and more ragged and raw. 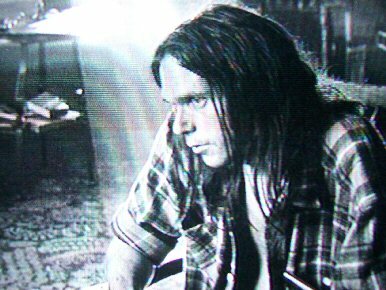 "I really don't know how long it took me to understand the artistic statement Neil was making but I understand now and was starting to understand then that Neil Young was not someone who was going to let a public perception of him as some kind of laid-back hippie define the art that he was producing. He was following his muse, not the expectations of his record company or his fans, or the general record-buying public. He was making the music he wanted to make. I just loved that Neil was not in this to cash out on a few pop-star hits and fade away---he was in this for the long haul." 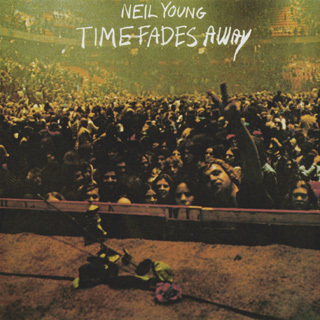 It is against this backdrop that we can begin to understand Neil's deteriorating mindset during the tour and how viscerally this comes across. Even 30 years later through the crackles of my well worn vinyl record, we can only imagine what audiences must have thought upon hearing these songs. "We'll probably never know if it had any effect on Neil's decision - but that scarcely matters, what matters is that folks can now buy the album and decide for themselves if it was worth it. 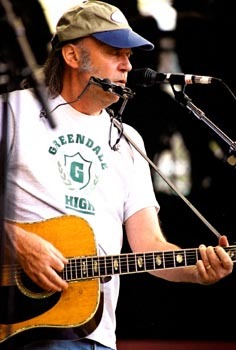 And of course a big thank you to Neil Young himself for finally doing it. You had your reasons Neil, I guess but now that it's out, maybe everyone including Neil Young will stop worrying about it." In the meantime, sign the petition today.